Kuving Juicer Review 2019: Which one is for you? As a food connoisseur with little talent in cooking, the different models of Kuvings juicer have been a blessing to me. Unlike the elaborate dishes that require extensive prep, churning out exotic juices does not take much effort as long as the juicer used is of good quality. Kuvings juicers allow me to experiment, mix up different fruit combinations, and sample the resultant quirky flavors with minimum fuss. 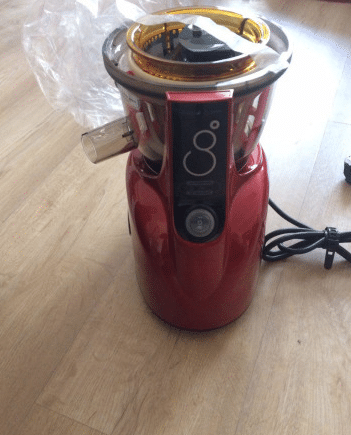 This is why we’ve prepared this Kuving Juicer review. There are several different types of juicers that specialize in offering particular functionalities. These range from slow juicers that ensure the preservation of nutrient content of the fruits being juiced to silent juicers that specialize in cutting back the noise produced during the process. You can acquire one type or the other depending on your priorities and needs. Or you can get both types to use alternatively whenever you need either functionality. Juicers are a great help if you are trying to switch to a healthy diet or attempting a juice cleanse. Furthermore, unlike solid fruits that need you to consume the fibrous part, putting considerable strain on your digestive system, fruit juices are light and nutritious. Not only are they less time-consuming to prepare but they can also be easily carried around while on a run or to work. Recently, I got myself two Kuving juicers which I had been wanting to try out for a while. Being confused about which one to choose from the several different varieties available, I got two for myself and two more for my parents. So, based on my experience, here is my Kuving Juicer review for all four models to help you decide which one to go for. Kuvings juicers come with a few trademark features characteristic of this brand that has major footprints in several countries across the continents of Europe, North America, Asia, and Australia. The slow juicers from this brand are scientifically proven to provide better nutrient content. 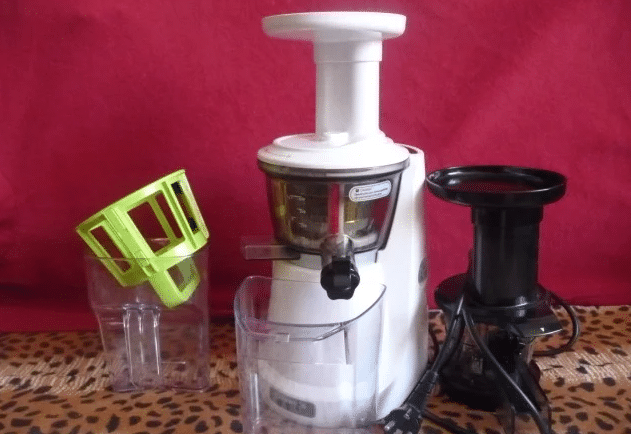 Let us take a look at the two juicer models from Kuvings that I have used. This slow juicer does exactly what slow juicers do best; preserve the nutrient content of the fruits being squeezed into juice form. This is achieved by using masticating technology that reduces the speed at which the fruits and vegetables are crushed within the juicer to about 60 RPM or revolutions per minutes. This ensures that the nutrients and minerals contained by your fresh produce will not be lost due to oxidation.Another reason to love this Kuvings wide mouth juicer is the width of its feeding chute, which stands at 3 inches in diameter. This wide mouth structure ensures that you can insert an entire fruit, such as apples or bananas, into it without having to chop and prepare them in any way. This drastically reduces precious preparation time during those hectic mornings when you are running late for work. Measuring at 9” x 8” x 17.5” and weighing about 16 pounds, the juicer is lightweight and portable. The juicer comes with a detachable hopper that can be used to insert smaller ingredients into the chute with more ease. The brushless motor produces a torque of 240W that effortlessly crushes and squeezes entire fruits into juice. It comes with a pulp strainer that helps you separate the unwanted pulp from the juice. A cleaning tool is provided that is equipped with additional brushes that makes cleaning the juicer super easy. The detachable smart cap provided with the juicer is drip-free and perfect for making mixed juice. My own experience with using these juicers for a few months indicates that the ease of use offered by Kuvings is unparalleled. This matches with the testimonies of several others that I have gleaned from binge reading online user reviews while researching for my purchase, all of which express satisfaction. 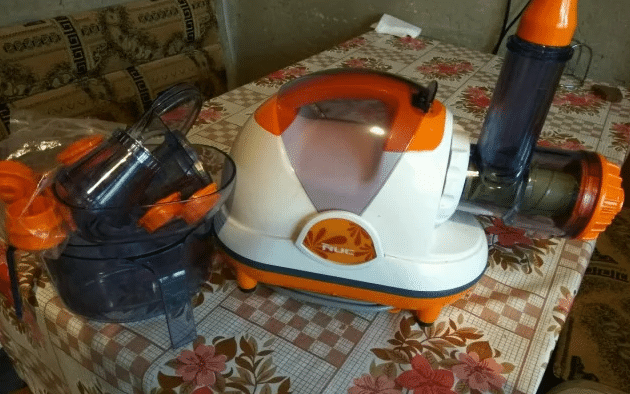 The juicer is very easy to assemble and disassemble before and after use, which adds to the convenience factor of this appliance. This Kuvings silent juicer is especially helpful for those who hate noisy appliances and wish to maintain the peace of their mornings while making their juice. This juicer uses a motor that employs low speed and gear reduction technology to keep the vibration at a minimum. Lowered vibration leads to less noise produced and you have at your hand an almost silent appliance. The wide feeding tube measuring at 3 inches cuts back preparation time by 40%. The product comes with three cleaning tools that make cleaning it a simple task. The detachable Smart Cap that comes with the product does not drip. A blank strainer is provided with the kit that can be used to convert your extracted juice into frozen yogurt. Furthermore, Kuvings equips this juicer with its patented low speed masticating technology. This ensures that the juices are extracted out of crushed fruits and vegetables without the use of a high-speed rotating blade. This reduces the oxidization of important enzymes to a negligent amount, thus preserving the nutrient content of the juice. The other models from this brand that I have used also bear up to a closer look. First of them is the Kuvings Silent SC Series that uses their patented masticating technology to offer the same high nutrient preservation functionality as the two previous models. So, if you are a health enthusiast looking to maintain your juice intake for detox purposes, this juicer is perfect for you. Furthermore, as the name of the product implies, this juicer produces minimum vibration and noise. It consumes about 240 watts of energy with its motor producing a rotating speed of 80RPM. It comes with a patented cleaning tool that makes keeping the appliance neat and clean at all times super easy. The hopper has a long neck to ensure that your hands do not remain stuck while you insert the fruits when the switch is on. The juicer comes equipped with a magnetic sensor that automatically switches off the appliance if it is assembled wrong. The juicing bowl and cup are BPA-free that further ensures that no harmful chemicals from the container mixes with and contaminates the juice you consume. From the aforementioned features, it is evident that this particular offering from Kuvings prioritizes the safety of the consumer over everything else. 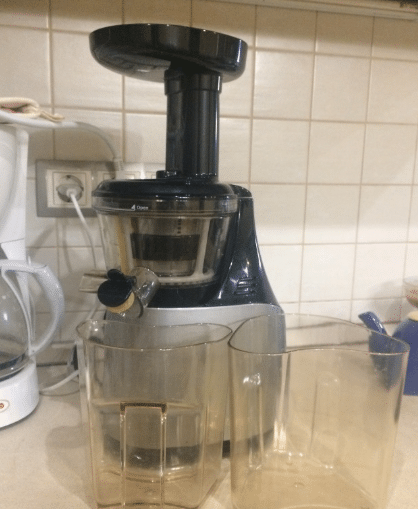 My experience with this juicer has been so that any difference in the quality of juice produced, ease of use, and convenience offered by this model was indecipherable from the previous models used. It comes with a 10-year guarantee that enables you to use it for a long while. This offering from Kuvings foregoes traditional high-speed masticating juicers. It instead opts for incorporating a cold pressed juicer technology to best preserve the high nutrient content of your fruits and vegetables even in juice form. 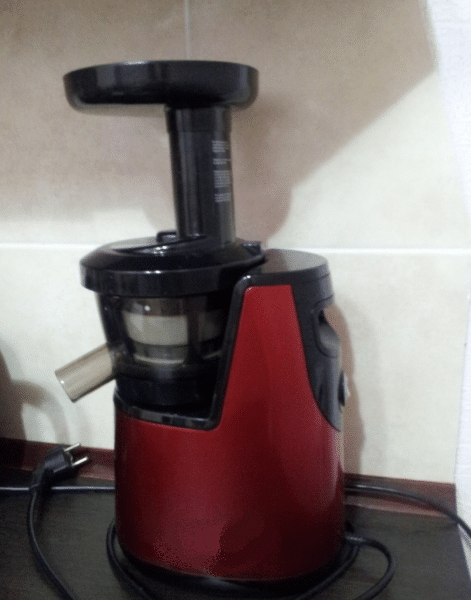 Consequently if like me, you too want a juicer to make juice that you will directly consume, this juicer is a great buy. Many people find foam in their juices to be slightly revolting. A uniformly consistent juice with no frothy layer on top is much more appealing and tastes better too. This juicer uses a juicing screw equipped with a single gear that reduces the production of foam in the extracted juice. Unlike regular juicers that use double gears, the juice produced by this appliance has just the right clear consistency that makes all the difference to its flavor. A low-speed motor that only produces a low speed of 70 RPM at 170W. It offers users a lot of versatility in use through its seven different nozzles, which lend it multiple functionalities that include mincing and grinding, along with churning out pasta. It comes equipped with a heavy-duty juicing screw. This multipurpose juicer is especially effective for those who wish to use it for a variety of cooking purposes, including preparing your own pasta. Its convenient design combined with user-friendly features, such as handles, ensure that even a newbie will have no trouble operating the device with ease. Buying a juicer requires some research on your part to ensure that the product you settle on is suited to your specific needs. Juicers are an appliance that provides you with an easy and hassle-free way of procuring the ultimate health food. As such, irrespective of whatever feature a juicer model advertises, the final emphasis has to be on the safety and quality of the juice it produces. It is only after ensuring the quality and nutrient preserving features of a juicer, that you should move on to looking for other functionalities. 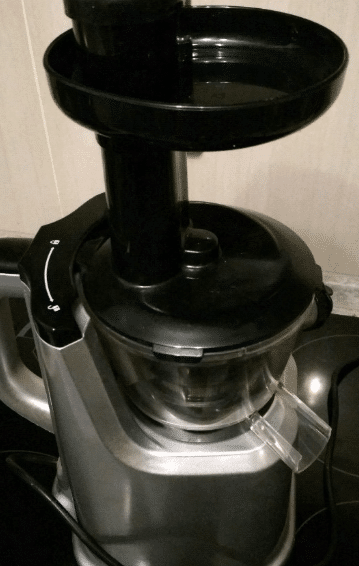 This kuving juicer review provides a range of these advantages that include noise reduction, foam reduction, ease of assemblage and cleaning, etc. And, none of these features are accommodated at the cost of compromising the nutrient level and purity of the juice produced. Circulon Symmetry Hard Anodized Nonstick 11-Piece Cookware Set Review: Timeless Classic Or Modern Trash?